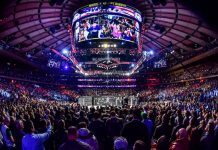 A welterweight scrap between Ben Saunders and Alan Jouban kicked off tonight’s UFC on FOX televised prelims in Orlando. 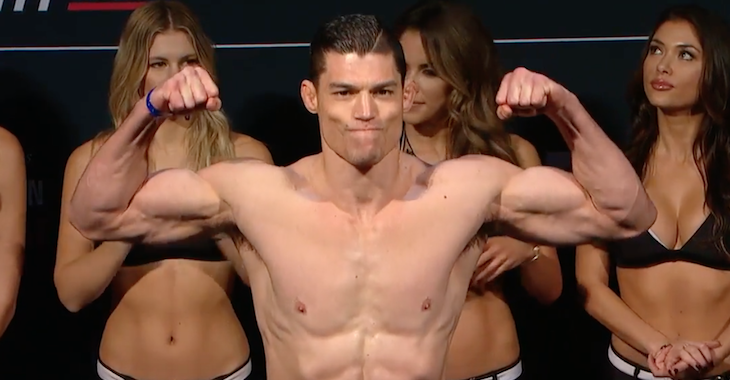 Round one begins and Jouban lands a nice body kick early. Saunders presses forward with punches and lands a right hand. He attempts to press Alan against the cage but Jouban quickly scrambles free. Jouban with a nice combination that finishes with a kick to the body. He follows that up with a low kick. Saunders leaps in with a right hand that connects. Alan circles off the cage. He lands a low kick. Saunders presses forward with a high kick. Jouban replies with an uppercut. Another good low kick from Jouban. Both men exchange big punches now. Saunders with forward pressure but he eats three leg kicks in a row for his troubles. Jouban with a big combination. Saunders appears to be rocked. Jouban with another low kick. He lands a nice right hook. That backs Saunders up. Jouban with a left hand over the top. Saunders throws a kick and it connects low. That causes the referee to step in and call a stop to the action. 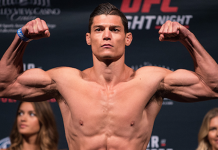 We restart and Jouban lands a some big shots. He catches Saunders with another nasty low kick. He follows that up with an uppercut and Saunders is down. Jouban let’s him back up and then connects with another hard low kick. Excellent stuff here from Alan. Round one comes to an end. Round two begins and Saunders quickly takes the center of the cage. He comes forward with a combination but nothing connects. Another combination is avoided by Jouban. Alan with a nice outside low kick. He lands a big body kick and then some uppercuts. Saunders in all sorts of trouble. Punches and elbows from Jouban. This fight is crazy. Jouban with another elbow. 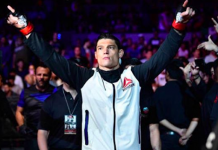 The fighters briefly clinch but Jouban opts to break free. Saunders with pressure now. Alan catches him with an uppercut followed by an elbow. Somehow Ben continues to press the action. Jouban catches him with an uppercut followed by an elbow. Alan with a kick and then a left hand that floors Saunders. This one is all over. WOW!